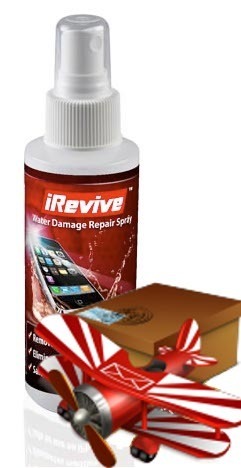 This video walks you through the process to fix a water damaged iPhone 3G or 3GS with iRevive. In the video we use an iPhone 3G, if you have a 3GS there is a #7 cable in the bottom right corner of the phone. 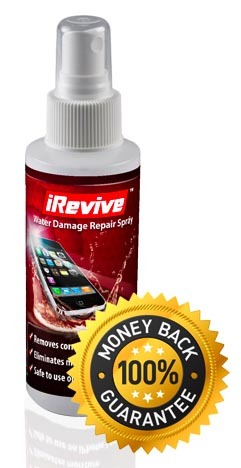 Other than that, the water damage repair process is the same for both phones. There are 4 water damage sensors located on the iPhone 3G and 3GS. In the picture on the right you can see 2 of the internal water damage sensors on an iPhone 3G logic board. The other 2 sensors are located in the bottom of the headphone jack and and inside the charging port at the base of the phone. With the phone powered off and the SIM card tray taken out, remove the two bottom screws from the bottom of the phone. You will be using your phillips screw driver (+) for the 3G and the 3GS. Use the suction cup to lift the screen assembly out of the phone. Notice the placement of the suction cup underneath the home button and how to hold the phone. You must lift up the bottom of the screen first. Use your flat screw driver to disconnect the 3 cables that hold the screen on. Do this by gently sliding the screw driver under the edge of the cable and then lift up. Now that you have the phone open check the water damage sensors. The sensors are a black circle and inside the middle of the circle will be red or white. If they are red, that means water has made its way inside the phone. If they are white, they have not been exposed to enough water to trip them. We have seen white sensors on water damaged phones before. It only takes a little bit of corrosion to put a phone out of comission. So even if you see white sensors, still go ahead and do the entire iRevive process for the best chance of saving your wet cell phone. Remove the 8 screws that hold the logic board down. One of them will be under a "Do Not Remove Sticker"
Use your flat screw driver to lift the camera up from the outside corner. After that use your screw driver to disconnect the #4, #5, #6 and if a 3GS the #7 cable. Use the pry tool to lift the logic board out of the phone. Pry near the base as shown in the picture. Once you have lifted the rear end of the board high enough to grab it, hold it from the sides and pull it backwards to lift out. Carefully use the flat screw driver to remove the 2 plates that cover the logic board. You can see an indent in each tab. Only use enough force to lift the tab so that the indents no longer line up. you do not need to bend these tabs very far. Now its time to remove the water damage and corrosion from the logic board. Spray iRevive onto the board and carefully scrub with the included brush. Give extra attention to any parts of the board that have corrosion and make sure to do both sides. Once you are done with the cleaning, you need to let the board dry for at least 1 hour, preferably overnight. You can also use a blowdryer on COOL mode to speed this process up. *While the board is drying, test the battery for water damage and check the other components. Once the logic board is completly dry and all the corrosion is removed, snap the plates back on. Reattach the camera flex cable and then slide the logic board back into the phone. On the 3GS watch out for the #7 cable getting stuck under the board. Reconnect the 4, 5, 6 & 7 cables and then put the 8 screws back in. Power the phone back on! You may need to connect it to a charger and leave it for a few minutes since exposure to water can completly drain the battery.